Risks of regular aspirin use may outweigh the benefits for healthy seniors. For decades, a daily dose of aspirin has been widely considered a way to protect healthy people from cardiovascular disease and even cancer. 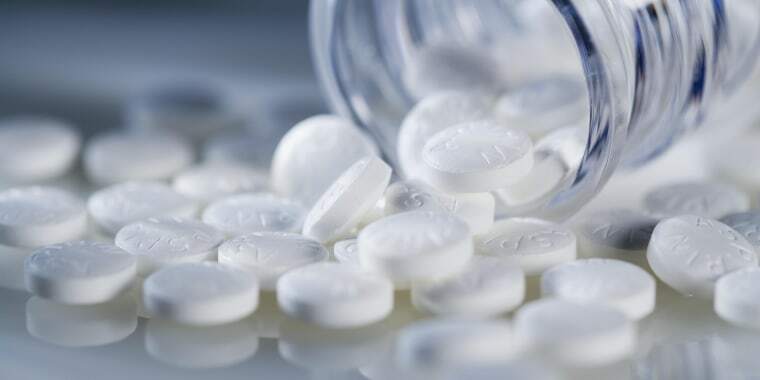 But a large, international study finds that, even at low doses, long-term use of aspirin may be harmful — without providing benefit — for older people who have not already had a heart attack or stroke. The new research reinforces the results from a study published in late August, which concluded that daily low-dose aspirin was too risky to be prescribed to patients at moderate risk of heart disease. In the August study and the new one, researchers found a significant risk of internal gastric bleeding caused by the medication, which thins the blood. Older patients experienced no health benefits from taking aspirin, according to the new report, published Sunday in the New England Journal of Medicine. The current guidelines recommend a daily aspirin for adults in their 50s who are at high risk of cardiovascular disease, such as high blood pressure, high cholesterol or a history of smoking. The new study was designed to find out whether low-dose aspirin could prolong healthy, independent living in seniors who had not shown signs of heart disease. "For healthy people, 70 and older, who don’t have a reason to be on aspirin, such as a previous heart attack or stroke, there was no discernible benefit," Murray told NBC News. The trial followed 19,114 seniors — 2,411 from the U.S. and 16,703 Australians — for an average of 4.7 years. The minimum age for Caucasian participants was 70 and 65 for African-American and Hispanic volunteers, due to their higher risk of dementia and cardiovascular disease. At the end of the trial, 90.3 percent of the aspirin-treated patients were still alive, compared to 90.5 percent of those who received placebos. Rates of physical disability and dementia were similar between the groups. The rates of coronary heart disease, heart attacks and strokes were also similar. The big difference between the groups was the higher rate of internal bleeding in the aspirin-treated group, including gastrointestinal bleeding, compared to the placebo group. There was also an increase in cancer deaths in the aspirin-treated group, which surprised the researchers. Previous studies found aspirin may be protective against certain kinds of cancer. It may ultimately turn out that there are more benefits than risks in certain populations, said the study’s lead author, John McNeil, a professor in the department of epidemiology and preventive medicine in the School of Public Health and Preventive Medicine at Monash University in Melbourne. “But we have not identified results that are strikingly different,” McNeil said in an email. Further research that may identify which groups would benefit from regular aspirin use is underway, McNeil said. Cardiologist Dr. Erin Michos called the results, "alarming," saying that aspirin should be prescribed only selectively. “I think it is time we started to phase out the use of aspirin broadly for the purposes of prevention in individuals who have not had a heart attack or stroke," said Michos, an associate professor of medicine and epidemiology and director of preventive cardiology at the Ciccarone Center for the Prevention of Heart Disease at the Johns Hopkins School of Medicine. Dr. Ravi Dave says aspirin may make sense for a small group of older, healthy patients, even if they haven’t already had a heart attack or stroke, such as smokers. But for healthy patients who have not had a heart attack or stroke and who are not at high risk, “I would consider taking them off,” said Dave, director of interventional cardiology at the University of California, Los Angeles. NBC News' Judy Silverman and Lauren Dunn contributed to this report.